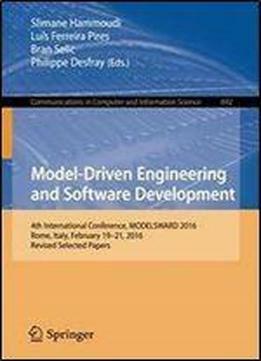 This book constitutes thoroughly revised and selected papers from the 4th International Conference on Model-Driven Engineering and Software Development, MODELSWARD 2016, held in Rome, Italy, in February 2016. The 17 thoroughly revised and extended papers presented in this volume were carefully reviewed and selected from 118 submissions. They are organized in topical sections named: modeling languages, tools and architectures methodologies, processes and platforms applications and software development.